Exploring the phase space of fluid deformations using high throughput computing: Each configuration of microfluidic system (pillar diameter, channel height, and flow speed) results is a specific fluid deformation. XSEDE resources were used to classify these deformations. Such classification is fundamental to subsequent fluid sculpting. (Phys.org) —Have you ever noticed the way water flows around boulders in a fast-moving river, creating areas of stillness and intense motion? 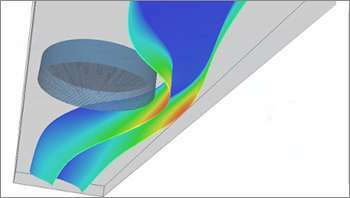 What if those forces of fluid flow could be controlled at the smallest levels? "Most microfluidic flow is at a very low speed," said Baskar Ganapathysubramaniam, assistant professor of mechanical engineering at Iowa State and one of the lead researchers. "At that speed, the flow hugs the cylinder and there's fore-aft symmetry. Whatever's happening upstream is exactly mirrored downstream. But if you increase the speed—or more technically, the Reynolds number—slightly, you can break this symmetry and get wakes, vortices, and non-trivial deformations." All of which create distinct flows. A team of researchers with access to 10 supercomputers at six high performance computing centers across three continents worked together to continue and extend Ganapathysubramaniam's microfluidics simulations. 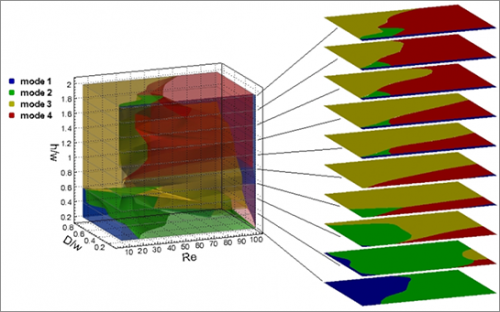 Above, a map of the HPC resources used in the computational experiment.